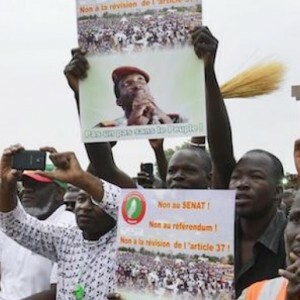 Long known for its relative stability in a particularly troubled region, Burkina Faso is now at a crossroads, torn by political differences over the proposed constitutional amendment to allow current President Blaise Compaoré to run for another term in 2015. Since July 2013, the country has been experiencing socio-political tensions over plans to establish the Senate. The opposition suspects those in power will use this to revise Article 37 of the constitution, which currently limits to two the number of five-year terms a president can serve, and organise a constitutional referendum for the same purpose.